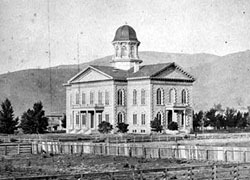 The Nevada State Capitol was designed by San Francisco architect Joseph Gosling for $250, and built by local building contractor Peter Cavanaugh between 1870 and 1871. It is a two-story masonry Classical Revival structure that incorporates Renaissance Revival and Italianate elements into its composition. It is a building of monumental character and harmonious proportions. To keep costs low, the sandstone was obtained free of charge from the Nevada State Prison quarry, just outside of Carson. The original footprint of the capitol was cruciform, a central rectangle with two wings. The first floor contained a major office at each corner connect by central halls, while the wings of the second floor were filled by the two legislative chambers--the Assembly and the Senate. The octagonal dome topped with a cupola admitted light to the second story. In 1906, an octagonal Annex was added to the rear (east) of the capitol to house the State Library. By the early 20th century, the legislature had outgrown the capitol, and prominent Nevada architect Frederic DeLongchamps was contracted to design northern and southern legislative wings, completed in time for the 1915 session. These compatible wings used stone from the same quarry as the original portion of the capitol, and provided more office space and expanded legislative chambers. For more than 50 years, all three branches of the state government were housed in the Capitol. The Nevada Supreme Court met here until 1937, when it moved into an adjacent building and the state legislature met here until 1971, when it moved to its new Legislative Building just south of the Capitol. Every Nevada governor except the first has had his office in the capitol. Today, the Capitol continues to serve the Governor, and contains historical exhibits on the second floor. 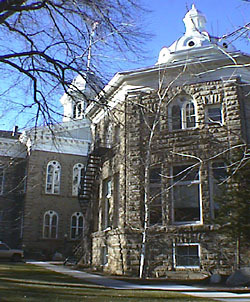 The Nevada State Capitol is located at 101 North Carson St. in Carson City. The Capitol is open to the public for self-guided tours; hours are 8:00am to 5:00pm, Monday through Friday. Call 1-800-NEVADA-1 or e-mail cccvb@visitcarsoncity.com for further information.